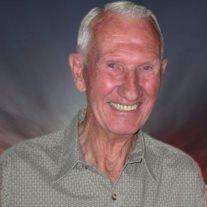 Gilbert, AZ – Grant Briant Roberts, 88, passed away peacefully in his home on Monday, February 17, 2014. He was born October 4, 1925 in Clearfield, UT. He is the son of William Robert Roberts and Enid Murdock Roberts. He graduated from Davis High School and served in the US Army from 1951 to 1953. He married Deon Harman on October 18, 1956 in Granger, UT. He lived most of his life in Layton, UT where he farmed and drove a school bus for Davis County School District. He and his loving wife retired to St. George, UT then later moved to Gilbert, AZ where he spent this past year surrounded by loving family. Grant enjoyed traveling with his wife in their RV to visit family and friends across the country. He was an avid reader. Yet, his greatest joy was spending time and enjoying his family. He is survived by his wife, Deon (Gilbert, AZ), children Cal Roberts (Chay), Kerry Roberts (Sheila), Michelle Elliott (Steve), 10 grandchildren and 5 great-grandchildren. Surviving siblings are Paul Roberts and Barbara Anderson. Funeral services will be Monday, February 24, 2014, 11 AM at the LDS Power Ranch Second Ward, 4170 S. Ranch House Parkway, Gilbert, AZ 85297. Friends may visit Monday from 10-11 AM. Arrangements by Bunker’s Garden Chapel.